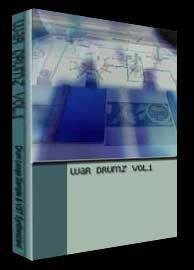 War Drumz Vol. 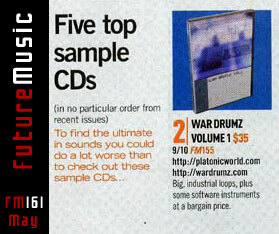 1. is not just another sample CD-Rom full of drum loops, We thought we would try something new. Not only do you get over 600 drumloops and 50 drum hits, but we've also included 3 VSTi Synthesizers and 2 VST effects. 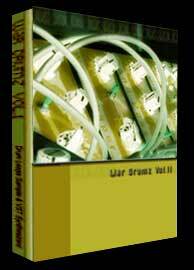 Below is a description of each VST on the War Drumz Vol. 1 CD-Rom. 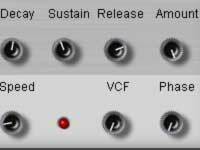 Each VST synth has 50 presets and each VST effect contanes 10 presets. You can listen to some samples of each synth and view screen shots too. Micron: Micron is a 1 oscillators analog style synthesizer with 2 filters, 2 envelope generators, a wave shaper, 2 LFOs, and a delay section. This delay section in very unique because you can filter the delay signal different then the main signal, pan the delay signal. This is a great Synthesizer for lead sounds. X-Nine: X-Nine is a great analog style base synthesizer, it contains 2 oscillators, a sample rate down grade. 2 envelope generators and what makes this synth unique is it’s massive filter section it’s splits the signal into 5 different frequency ranges and lets you filter each one independently. This allows you to achieve complex sounds within different frequency rages. Like a deep low end base with a high squealing resonance. Reduction: Reduction is a 3 oscillators analog style synthesizer with 2 filters, 4 envelope generators one has a tempo sync loop function. It also contains a modulation bank and 3 LFOs. Reduction also has lots of very crazy routing possibilities and comes with 40 presets. Obtuse FX: Obtuse is a VST affect with some very cool features. It has an audio to voltage converter that then gets applied to the the2 filters. What this does is makes the frequency of the filters follow the audio running throw Obtuse. It also has a LFO that can modulate the filters or the pan. Impediment FX: Impediment is a very crazy VST affect with 1 tempo synced looping envelope generator. It also has a filter that can follow the looping of the envelope generator.